Growing potatoes takes some effort and a good deal of space. Determine how much land you want to dedicate to the crop and prepare the soil accordingly. Seed potatoes should be prepared before planting by cutting them into 1 ½- to 2-inch square pieces, each with one to two eyes. Once they are planted, watering and adding soil or mulch to the hills is all you have to do until it is time to harvest. Conventional wisdom recommends planting seed potatoes in trenches. The size of the trench and other spacing requirements depend on the size of your garden. The depth of the trench should be 6 to 8 inches. The length is determined by the space you have or your own preference. Once the depth and length are dug out, the seed potatoes can be added. Spacing between plants is a matter of how deep you are planting the seed potatoes. If the trench is 6 to 8 inches deep, the potatoes should be placed in the trench at 12- to 18-inch intervals. If the trench is shallower because of environmental constraints or personal preference, then the spacing needs to be wider to allow the roots more room to forage for moisture and nutrients. The shallower the trench, the farther apart the seeds should be placed–up to several feet apart. Each trench will eventually be filled in and more soil added throughout the growing cycle, creating a “hilled” effect. For large-volume crops, where equipment is being used to do this work, the rows need to be 5 feet apart. For the home gardener, 2 to 3 feet between rows is sufficient. This allows ample working room between the rows for the gardener to work and enough room below the soil for the roots and developing potatoes. Once the seed potatoes are planted, fill the trench about 4 inches high with the soil removed from it. Once the sprouts reach 8 inches high, more soil should be mounded around the shoots, up to another 4 inches. This puts the roots at a lower, cooler place and leaves the top layer of soil loose. This is the area where the potatoes will grow. In two to three weeks, add another 1 to 2 inches of soil and repeat again two weeks after that. This keeps the enlarging potatoes covered. From the original trench depth of 8 inches, you will have added up to 12 inches of soil to make the height of the hill. For areas with rocky soil or other problems, the trench should be dug as deeply as possible but this method will work on top of the soil as well. Shake mulch made of straw, leaves or dried grass clippings over the seedbed until you have a depth of 6 to 10 inches. As the plants grow, continue adding mulch to build up the hill. 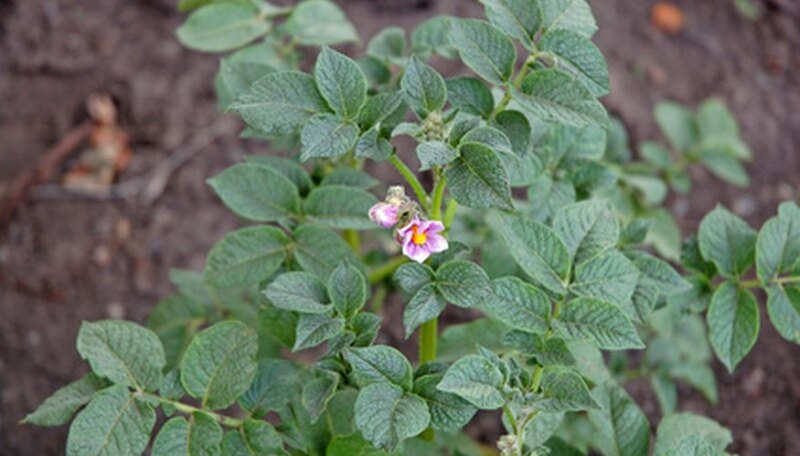 It provides weed control, moisture retention and keeps the potatoes covered and out of the sun. How Often Do You Need to Water Potatoes? How Does a Potato Grow?